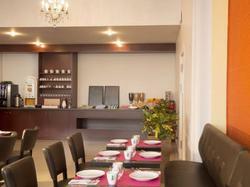 Offering a restaurant, Executive Hôtel Paris Gennevilliers is located in Gennevilliers. Free WiFi access is available. Each room here will provide you with a TV, air conditioning and satellite channels. Featuring a shower, private bathroom also comes with a hairdryer and free toiletries. You can enjoy city view from the room. Extras include a desk. At Executive Hôtel Paris Gennevilliers you will find a 24-hour front desk, a garden and a terrace. The property offers free parking. Paris - Charles de Gaulle Airport is 19 km away. This suite has a soundproofing, sofa and air conditioning.